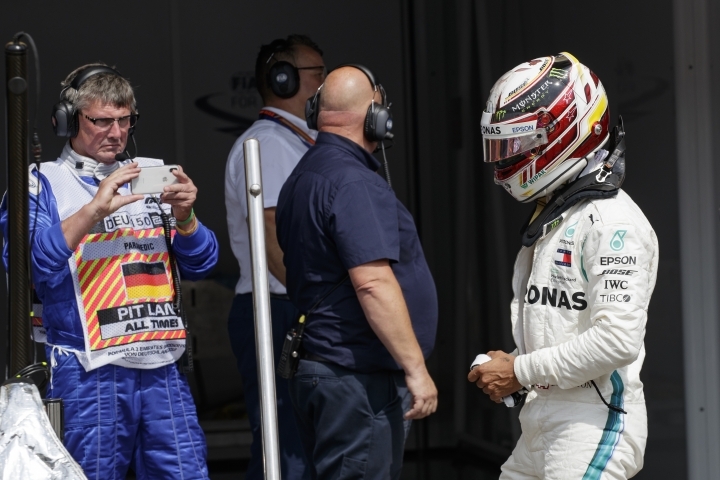 HOCKENHEIM, Germany — Crouching down by the side of his Mercedes, Lewis Hamilton lowered his head and stayed perfectly still for several moments. The British driver looked lost in thought, deep in contemplation, seemingly unable to believe what happened on Saturday. A hydraulic failure had just ended his qualifying run prematurely, dropping Formula One's all-time record-holder for pole positions to 14th on the grid for Sunday's race. Hamilton's hopes of winning a record-equaling fourth German Grand Prix — and matching Michael Schumacher— have been dented. And his woes are piling up as he duels with Sebastian Vettel — in a seemingly quicker Ferrari — for a fifth Formula One title. July has been a bad month for Hamilton. He retired from the Austrian GP and got knocked off the track at the British GP. He recovered from last to finish second in Silverstone and faces another uphill struggle at Hockenheim. Worse still, Vettel is going from pole. "We didn't know Ferrari would be so fast on the straights," Hamilton said, ruefully. After sliding off the track early in qualifying, Hamilton came back on. But because his power steering was failing he ploughed through rough grass and bounced over a kerb, sending the hefty-looking Mercedes momentarily airborne and down with a bit of a bump. "It definitely wasn't Lewis' driving. A hydraulic leak caused a power steering failure," Mercedes head of motorsport Toto Wolff said, seemingly keen to clear his star driver of blame. "We are unpicking how the problem happened. It was not caused by the driver." Hamilton even desperately tried to push his car back to the pits so he could continue qualifying. "My first thought was to get the car back to the garage at all costs," Hamilton said. But even with the help of track officials he realized it was a futile effort. So he stopped and knelt by the side of his car, grabbing hold of it with one hand and lowering his head as if almost in prayer. "I had just pushed a heavy car almost 100 meters. I was gathering my breath," he later explained. "Sometimes it takes a second to realize what happened (and) then you have to accept it." 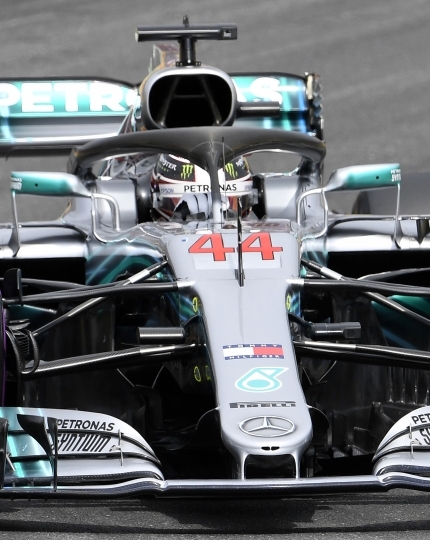 Mercedes used to be the ultimate in reliability, dominating F1 with four straight drivers' and constructors' championships. But the Silver Arrows team trails Ferrari by 20 points and Hamilton is eight behind Vettel. Those gaps could increase after Sunday, the 11th race of 21 this season. "We've got a severe warning today," Wolff said. However, warning signs have been glaring like a beacon this season. 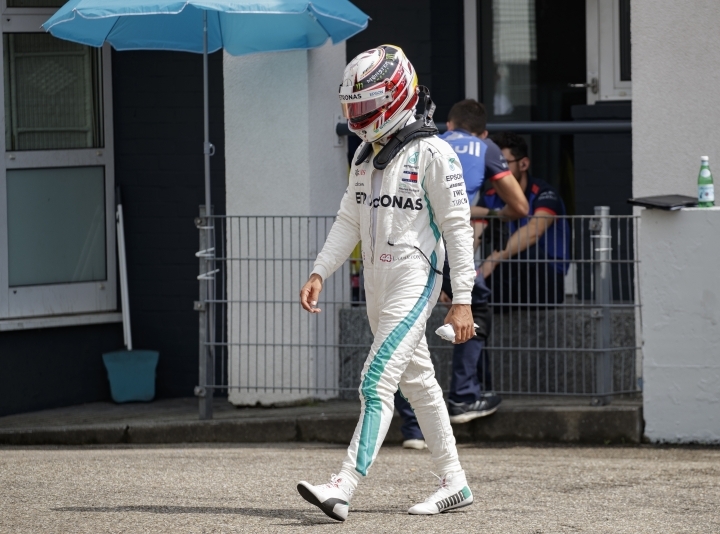 Mercedes has made strategy and communication errors , and Hamilton and Valtteri Bottas retired from the Austrian GP three weeks ago because of mechanical failure s.
"(Ferrari) haven't had the problems we've had. Maybe they will, maybe they won't," Hamilton said. "These are times when we just have to work harder. There's no excuse for these scenarios, and we don't try to make them." Wolff acknowledges the team is searching for answers, an uncomfortable position after years of dominance. "(There are) clearly lots of shortcomings on our side. We shouldn't have a double DNF in Austria, where we were running solid 1-2," Wolff said. "Lewis would have won the race; we would have scored 43 points, and would have been in the lead in both championships." Mercedes has much to work on, from the top down. "We need to improve, all of us. We need to improve the reliability and robustness of the car," Wolff continued. "We need to minimize strategic mistakes. We need to increase the output of the chassis and the engine in order to stay in the title fight."